Broad coverage increases service opportunities. Premium designed to fit and perform like original equipment welded assembly. Easy and quick bolt-on/clamp installation. Aluminized components for longer life. Original equipment appearance and performance. 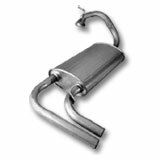 Limited Lifetime consumer warranty backed by AP Exhaust Products.